Cauldrons (a term for a group of bats) can be quite large depending on location and species. Bats are active and feed mainly after dusk, often seen flying around streetlights catching insects. Mosquitoes comprise a large part of their diet. Some scientists use bats as barometers for ecological and air quality, as bats tend to appear at night in larger numbers when barometric pressure is lower and insects are more likely to appear. NIEHS’ bat house is located to the left of the path just before you cross the bridge to the Memorial Garden. While bats are capable of carrying and transmitting rabies to human, transmission is rare if people follow safety precautions. 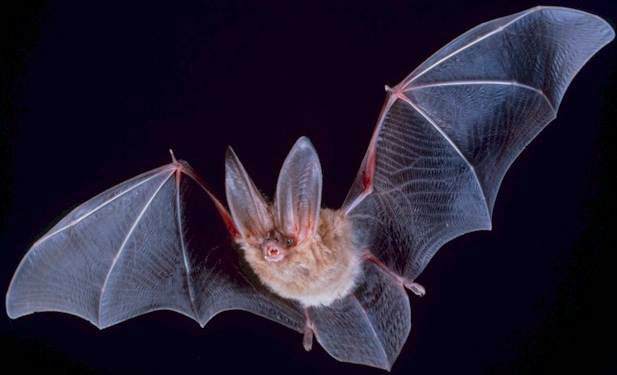 Even when infected, bats are not aggressive, unlike rabid raccoons, foxes, or dogs. Bats can sometimes invade house attics if they are unable to find a suitable roosting place outside to raise their young; wire screening over entry points to attics and homes can help prevent bats from nesting inside. If you have a bat infestation in your house, do not attempt to remove the bats yourself. It can be illegal to disturb bats during breeding season and when young are nursing or if the bat species is endangered, so call a pest control expert if you discover bats in your home. There is a bat house on campus near the Memorial Garden. Have you observed any bats or a bat house on campus at dusk or after dark?